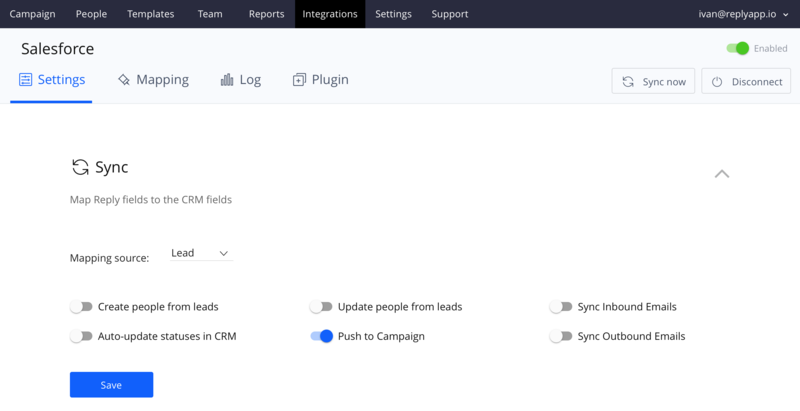 Learn how to get the most of your Salesforce integration with Reply: set up, customize, map fields, update statuses and track your leads. Log in to your Reply account, navigate to Settings -> Integrations -> Salesforce and hit 'Connect' button. Provide your Salesforce credentials in the opened window and submit permission for Reply. If everything is correct, you will be forwarded to integration settings page. You can pause and/or resume synchronization by pressing on ' Enabled' / 'Disabled' button. Also you can force immediate synchronization by pressing 'Sync now' button. 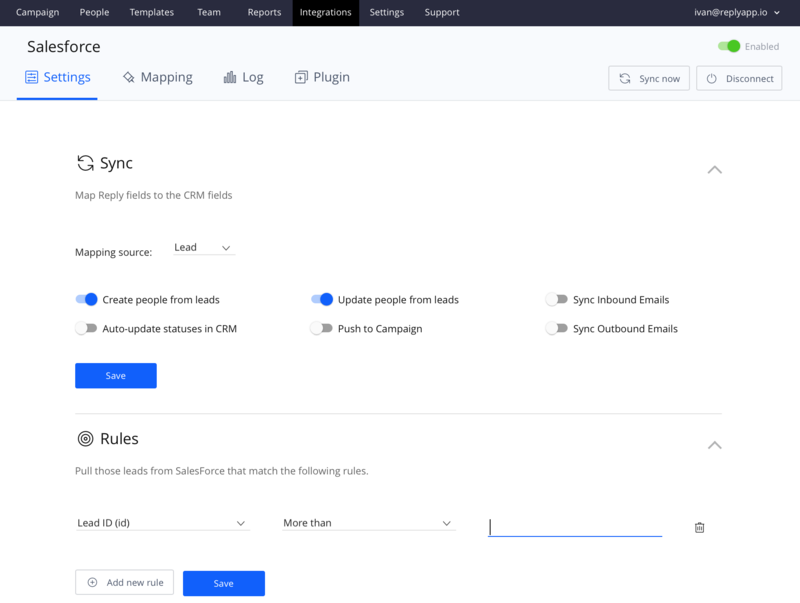 Sync tab contains all the available features, such as fetching Leads or Contacts from Salesforce and pushing to the campaign. Mapping tab will allow you to configure fields mapping. Logs will show you the detailed description of what items have been synchronized. Create / Update people from contacts. Salesforce users can fetch their Leads or Contacts in order to use them in Reply. Enabling ' Create people from contacts' option will get all the Leads or Contacts (you can specify it in 'Mapping source' menu) from Salesforce and add them to Reply. It is also possible to fetch specific Salesforce Leads or Contacts by creating filter rules. If you want your contacts updated with changes made in Salesforce, check the ' Update people from contact' and Reply prospects will reflect those changes. 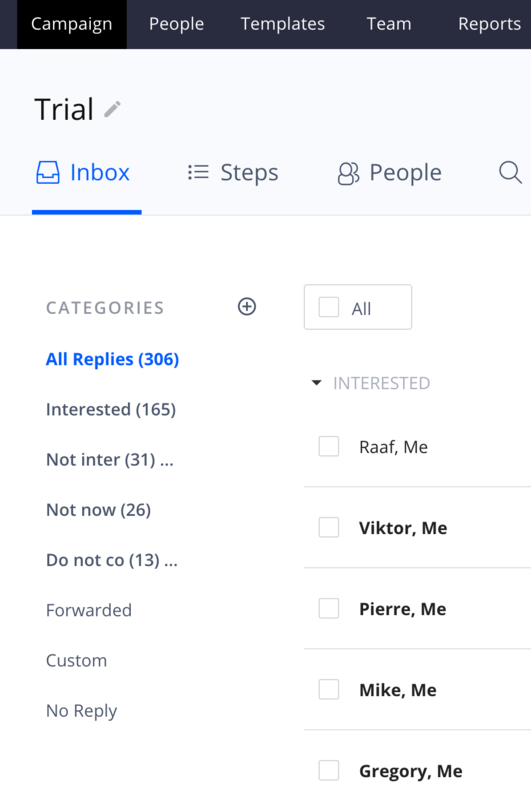 This feature enables synchronization between Reply campaign and Salesforce Lead information. You can choose whether you want all the campaigns to be synced or only specific ones. 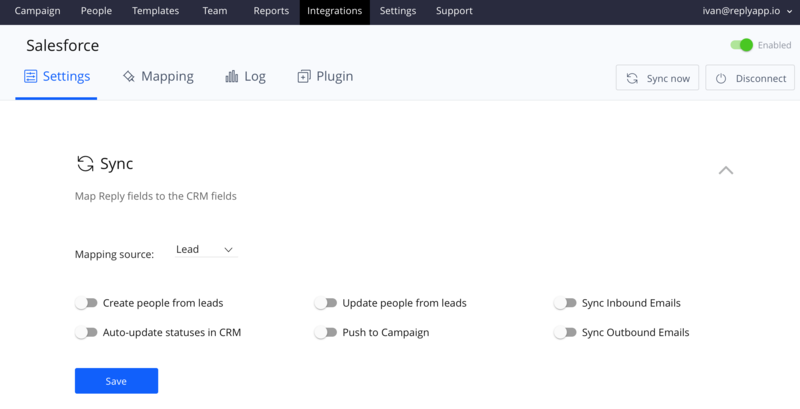 It can be configured in Setup -> Customize -> Leads -> Fields -> Lead Status. Now when response email is classified as 'Interested', 'Lead Status' field will be updated with 'Interested' value. 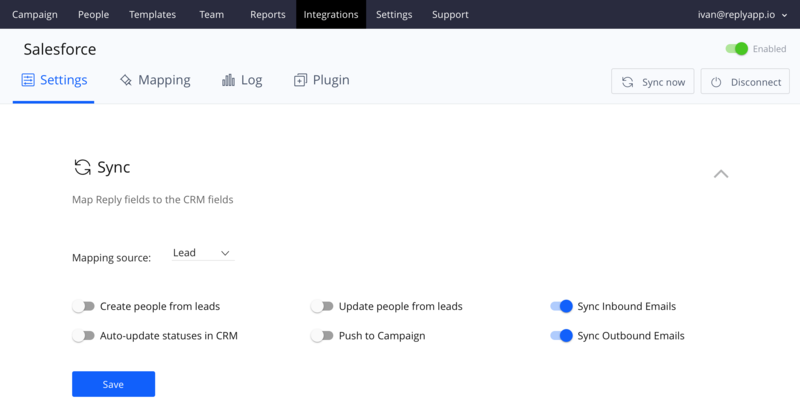 You can add Leads from Salesforce to ongoing Reply campaign by selecting ' Push to campaign' option. 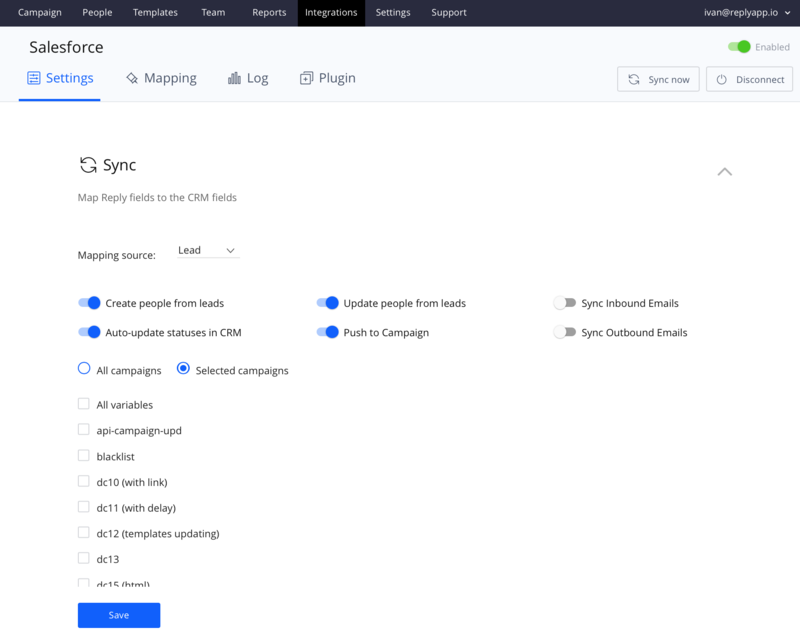 In order to use this functionality, you need to configure new (or use existing) campaign. Let's say the name of campaign is 'Follow Up'. Next thing to do is to review possible 'Lead Status' field values in Salesforce ( Setup -> Customize -> Leads -> Fields -> Lead Status). Make sure that one of the values of 'Lead Status' field should be named as your Reply campaign or should contain the name of Reply campaign in brackets (so in our case, one of field values should have either 'Follow Up' or 'Custom Name (Follow Up)' name). Now if we assign Lead with 'Follow Up' as 'Lead Status' field, this Lead will be created in Reply (if there is no existing contact already) and pushed to 'Follow Up' campaign. This feature allows us to sync inbound and outbound emails sent to Reply contacts within campaigns. All emails sent to or received from Reply contact via campaigns will be sent to corresponding Salesforce Lead or Contact (which have the same email address). These emails will be visible in ' Activity History' section of Lead / Contact details. All inbound emails are marked as [In], outbound - as [Out]. Connect to Production or Sandbox Salesforce account. You can connect Reply to your Production or Sandbox account. In order to do so, when you hit 'Connect' button in Settings-> Integrations ->Salesforce there is an option what account you want to connect to. In order to reconnect Reply to the production environment, once you already connected to the sandbox, please disconnect via link (shown below) and connect again with "Production environment" option. When connection to sandbox environment established, status will be shown in Integrations/Salesforce page.